Shujaat Bukhari was the editor of the newspaper 'Rising Kashmir' and was given police protection since an attack on him in 2000. Shujaat Bukhari was shot by unidentified gunmen at the Press Colony in Srinagar. Senior journalist Shujaat Bukhari was shot dead on Thursday evening outside his office in Srinagar in an audacious terror attack that has left the nation in shock. Mr Bukhari, the editor of Rising Kashmir newspaper, was shot at close range in the attack in which his two security officers were also killed. He was attacked when he had stepped out of his office in Press Colony in the city to head home. The killers emptied their magazines into their victims before fleeing the scene. The police say the killers were waiting for Shujaat Bukhari to come out of the building and it appeared to be a planned attack. It was not clear, however, who were responsible for the attack, Jammu and Kashmir police chief SP Vaid told NDTV. A CCTV grab, released by the police, shows the three attackers on a motorcycle. 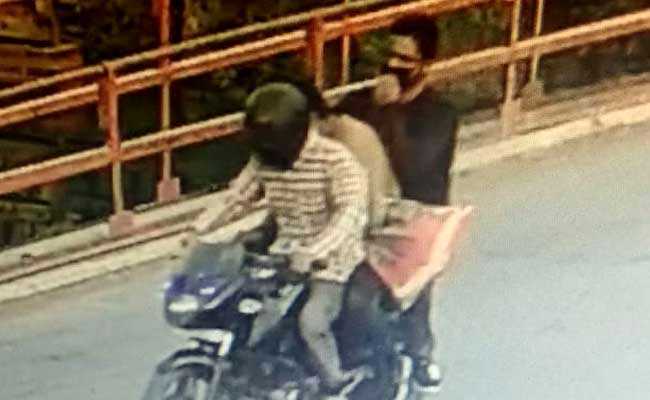 While the rider was wearing a helmet, the other two men were wearing masks to hide their identity. They can be seen carrying guns hidden in a sack. "Today at about 7:30 pm when he was coming out of his office and boarding his car, three terrorists, who had come on a motorcycle, opened fire. Two of his PSOs (personal security officers) were also hit... They were shot before they could react," he said. They (the terrorists) chose the iftaar time when everybody was rushing home. We will look into who these people are," he added. The attack took place hours after Home Minister Rajnath Singh held a security review meeting for the annual Amarnath pilgrimage that starts later this month. Sources say Rajnath Singh's peace initiative in Kashmir, a ceasefire, may not extend beyond Ramzan, which is expected to end with Eid day after tomorrow. On Twitter, he spoke out against the killing. Chief Minister Mehbooba Mufti visited the police hospital, where Mr Bukhari's body was brought, to console his grief-stricken family and appeared close to tears herself. "It's very difficult to believe. He came to meet me just a few days ago," she said. From the Editors Guild of India to the Press Club, condemnations of the attack were immediate and unreserved, calling on the state to improve security conditions for journalists. Calling Mr Bukhari "a voice of moderation and a courageous, big-hearted editor", the Editors' Guild said his killing "is a new low in a rapidly deteriorating environment for media practitioners in Kashmir, in particular, and in the country in general". "An attack on a journalist challenges the very foundations of a free press and vibrant democracy and more so in a state like Jammu and Kashmir... The Guild calls upon the Centre to take necessary steps to ensure a situation where the media can discharge its duties without any fear of violence," its statement read. Shujaat Bukhari was given police protection since an attack on him in 2000. He was instrumental in organising several conferences for peace in the Kashmir valley and mentored several young journalists. He was also part of the "Track II" or alternate channels dialogue process with Pakistan.